Take a pizza cutter and cut off the corners of all 24 wonton wrappers creating octagons. Place each wrapper in a mini muffin tin. Bake for 4-5 minutes or until wontons are crispy. Remove from oven. Start layering your bites. All of the measurements are approximate here. Start by adding a heaping teaspoon of rice. Next add some chicken, corn, and beans. Sprinkle with about a teaspoon of cheese on each one. Sprinkle with cumin and return to the oven for about 3 minutes or until cheese is melted. Remove from tins and garnish with any additional toppings such as sour cream or guacamole. Enjoy! Bite-sized crispy cups of chicken, cheese and all the other Mexican fixin’s you love. Go ahead – volunteer to make the appetizers for the next party! It's a Mexican fiesta and you're in charge of the appetizer! No worries. I have the perfect appetizer for you to bring. 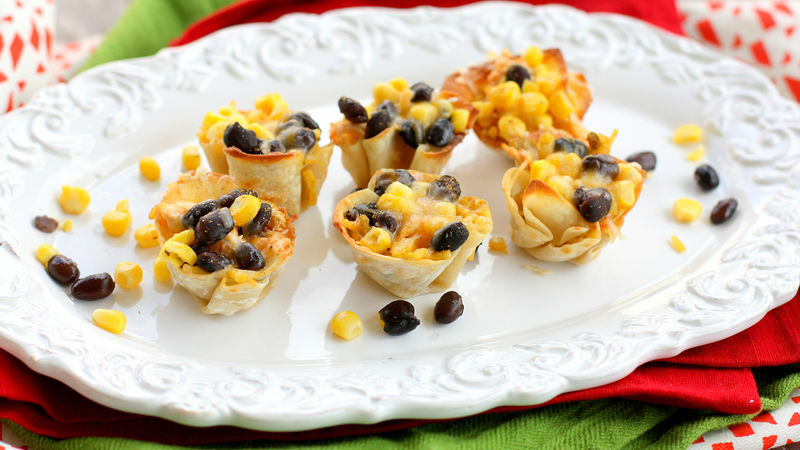 These Fiesta Chicken Bites are bite sized cups full of rice, chicken, beans, corn, and cheese (I can't get enough of these things!) -- all baked in a wonton wrapper. These really couldn't be any easier. First, let's prepare the chicken so that it's ready to go when we are. You can use leftover rotisserie chicken or just regular cooked and shredded chicken. Add some fajita seasoning to give it a whole lot of flavor. To make sure the chicken is moist and seasoned, add some salsa and mix it all in. Next, cut the corners off of your wonton wrappers to make an octagon shape. I know this doesn't really sound like a necessary step but since mini muffin tins are so small, cutting them helps them fit better and creates a perfectly ruffled little cup. Place one wrapper in each muffin cup. Bake them in the oven until they get all crispy and golden brown on the edges. It helps to hit them with some cooking spray to crisp them up. I like to think of this as the built in chip in this Mexican bite. Then we start adding all of our layers. You can totally eyeball it here and add as much or as little as you want of each ingredient. I added rice first. Then add the prepared chicken. Third, add a layer of corn and black beans. Sprinkle the top with cumin. If you wanted to make these ahead of time you could stop here until you're ready to serve. Then right before serving pop them in the oven for a couple of minutes to get the cheese nice and melted and the bites warmed through. It's hard not to eat at least five of these!